I couldn't remember the last time I enjoyed watching a basketball game. It must be during younger years when Jaworski was coaching one of the most-loved basketball teams in the Philippine Basketball history. But the Filipino Basketball fandom has united when the Gilas Pilipinas flew to Spain to compete with other countries' bests for the 2014 FIBA World Cup. We missed our chance in getting into the finals, but the whole world knows that the Philippines team gave a good play. 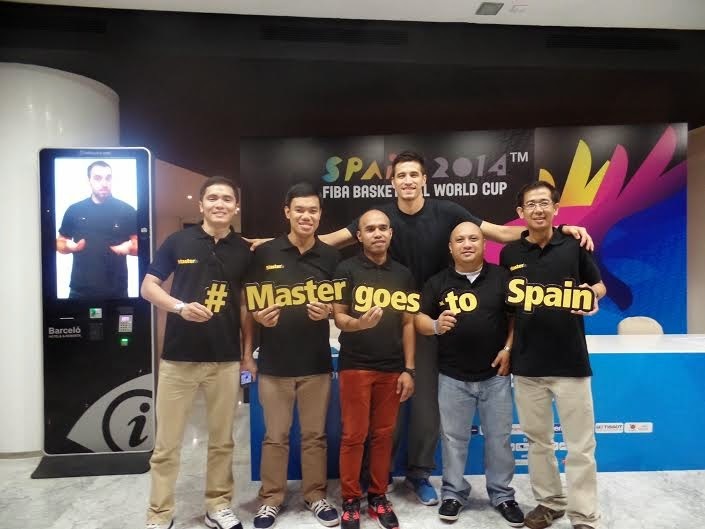 On a different story, guess who joined the Gilas Pilipinas to Spain during the FIBA event? The winners of the Master Game Face Goes to Spain promo, sponsored by the biggest male face care brand in the Philippines, all flew to Spain for an 8-day all expenses paid trip and a once-in-a-lifetime chance to watch live and cheer for members of the national men’s basketball team, as they put their oil-free game faces on and play in the biggest basketball event in the world. Player and Master Game Face ambassador Marc Pingris during a meet and greet event at the sidelights of the 2014 FIBA World Cup in Seville, Spain. Now that I don't have much budget to go on a trip, I am seriously considering joining contests that could win me a free trip! Who wants to go to London?